Cruse Bereavement Care (Cruse) was established in 1959 when an individual and others in a local community in Richmond, London recognised the need to provide support to improve the quality of life for bereaved widows and orphans after the second World War. The vision and passion of those few individuals inspired the growth over the past 6 decades to the current volunteer organisation based in local communities across England, Wales, Scotland and Northern Ireland. What is a More than Words Champion? 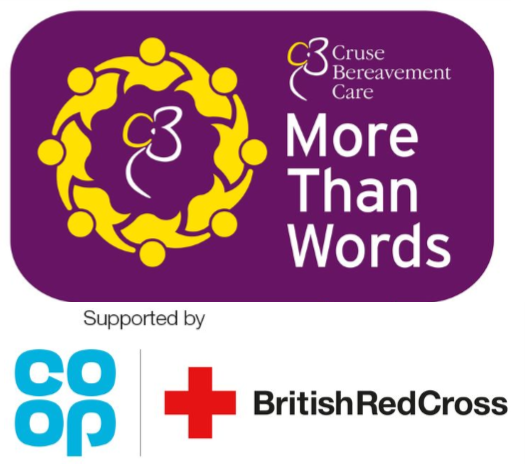 More than Words Champions are members of the community who are committed to combating feelings of isolation and/or loneliness following a bereavement. We hope (after the workshop) that Champions will feel comfortable handing out a signposting pack/information (e.g. local Samaritans number/address, the Cruse national helpline number etc.) to individuals who may be struggling and feeling especially lonely and or isolated following bereavement(s). Champions can decide on the initial social activities – with the expectation being that over time, this will become more of a collective decision amongst more regular attendees. Champions can speak with a Cruse Supervisor after an activity has taken place. This is mostly to ensure Champions have an opportunity to relay any concerns and/or ensure they are ok themselves. They attend a loss and bereavement awareness workshop. As always, we will not be chasing Champions and we do not expect everyone to assume this role for every activity. Should an individual wish to take a break, or would prefer not to be a Champion at all after the workshop, this is absolutely fine. How do I become a More than Words Champion? To become a More than Words Champion, please register your interest on our online form (located in the tab above). You must be willing to attend a (FREE) workshop, and actively engage in starting our co-running social groups specifically for bereaved individuals.